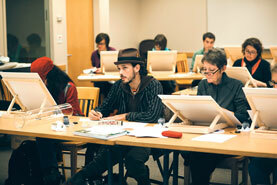 Ancient art form returns to campus. Breathe in. Hold your pen at an angle of 45 degrees. As you breathe out, grab the baseline with a downward stroke and finish with an exit serif. 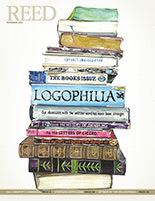 Welcome to the letter L—and to the Reed Scriptorium. 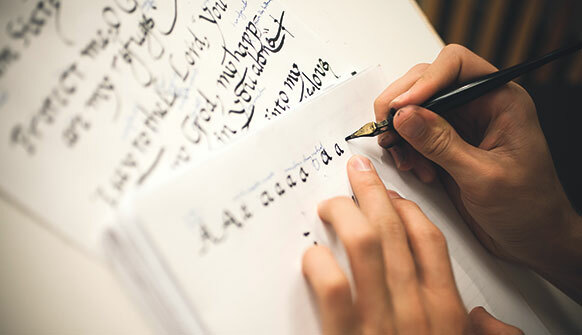 Twenty-eight years after the faculty voted to remove calligraphy from the curriculum, the art form is back at Reed in the form of the Calligraphy Initiative. The initiative was founded by Cooley Gallery director Stephanie Snyder ’91, who came to see how central calligraphy was to Reed’s living history when she and Gay Walker ’69 curated the exhibition Lloyd Reynolds: A Life of Forms in Art at the gallery in conjunction with Reed’s Centennial. During Reunions, former students of Lloyd Reynolds [art 1929–69] encouraged her to bring calligraphy back to campus. In 1984, when calligraphy was removed from the curriculum, there was no Cooley Gallery, Educational Outreach Initiative, or independent department that could steward such an activity. Stephanie realized it was possible to revive the discipline—without making it part of the academic program—if funding and a sponsoring department could be found. With a growing set of extracurricular educational programs, the Cooley Gallery emerged as an appropriate sponsor, but the initiative still needed money. After discussions with the college, Stephanie and her husband, Jonathan Snyder ’91, stepped forward to fund the initiative for the first few years. Jonathan is a senior manager at Adobe Systems, and his father David Snyder ’65 studied art history with Reynolds at Reed. The initiative takes a three-pronged approach. It begins with a weekly scriptorium, where students, faculty, alumni, and staff come together to practice their letters. On alternate weeks they receive formal instruction by Dubay, a former student of Reynolds, or engage in critical practice with Gregory. As part of the initiative, Gregory is incorporating paleography and calligraphy into the yearlong, K–12 teacher-training institute he conducts at the Cooley. The program provides continuing education credit to participating Portland Public School teachers. The initiative will also conduct workshop-based, noncredit calligraphy instruction, which might, upon the request of faculty, support instruction in the religion and art departments. Professor Kambiz GhaneaBassiri [religion 2002–] and Stephanie are working on an exhibition of Persian and Arabic calligraphy in 2014 to coincide with a residency by Persian calligraphy scholar Hamid Reza Ghelichkhani. Some question whether calligraphy is an anachronism in an age of digital communication, when people use opposable thumbs to text messages. Gregory says one might as well ask why in our vehicular age anyone would bother to walk.